Our Executive Director, Peter Blinston, being advised by our research team decided we release the Mpindo pack today. The pack of 2 adult painted dogs named Snow-Tail and Jonathan and their 8 pups have been in our Rehabilitation Facility for the past 6 months. We rescued them end of June from a communal land where they had denned. We all gathered up at the Rehab at around 7am for a briefing from Peter on how the capture operation was going to be carried out. Simple plan, lay out nets, drive the painted dogs to the net, get to them while they are still figuring out how to escape and call a vet to put them to sleep. 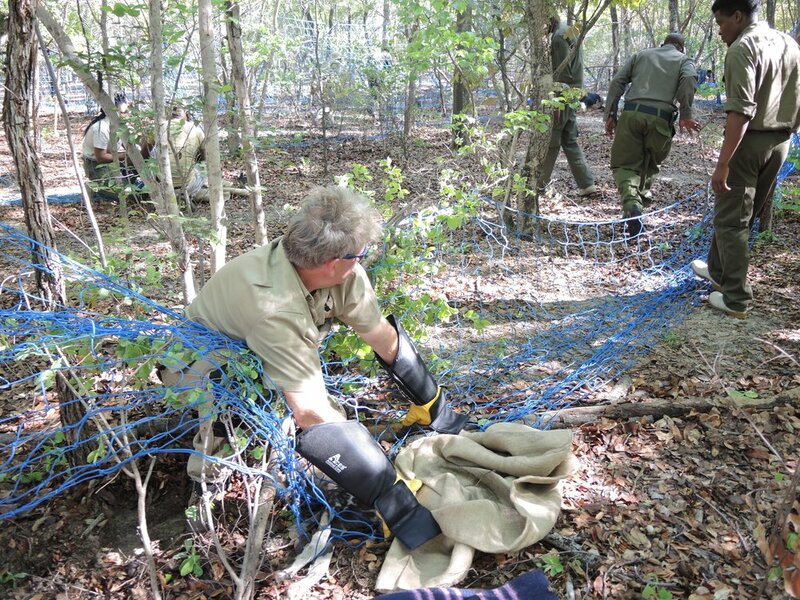 Among the team were PDC staff, John Lemon from Painted Dog Conservation Inc in Australia, 2 vets and some friends of PDC came together to carry out this operation. The team swiftly and efficiently got all 8 pups and the 2 adults. We immobilised them and fitted the adults with collars. 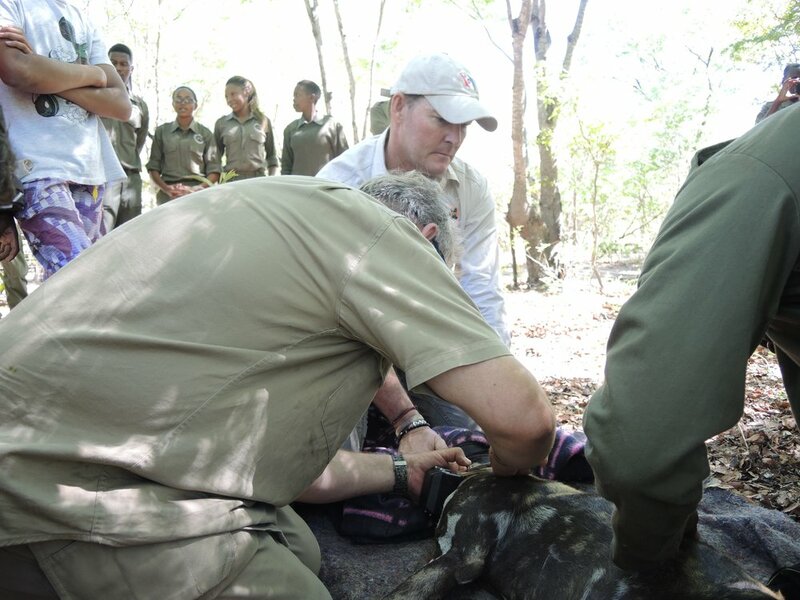 Snow-Tail, the alpha female, was fitted with a VHF collar, thanks to Wild Dogs MTB SA for donating one. 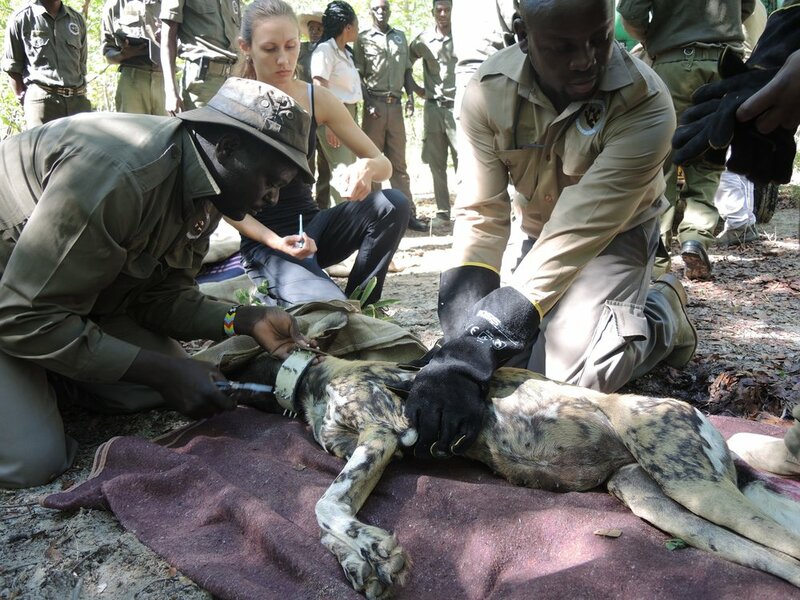 Jonathan, the alpha male, was fitted with GPS collar courtesy of Painted Dog Conservation UK. Soon enough all the ten dogs were in the trailer and we took off to the place of release, called Jambili, inside Hwange National Park, far from the communal land and hopefully in the safety of the protected area. We released the painted dogs at the Jambili pan. We believe the place has reasonable prey base and will help fast track the adaptation of the pack to their life back in the wild. This is what Peter had to say about the whole operation of capturing and releasing the Mpindo pack today. Thank you all for all your efforts, support and kind words through this whole mission from the time we brought in the Mpindo pack to the time we released it. Success that you have helped us achieve and with your continued support we will continue to change lives. Of both people and painted dogs. To support the work we do for painted dogs kindly donate and help us save the species from extinction. To contact us kindly fill in the contact form on the ‘Contact Us’ page or contact via our social media platforms Facebook, Twitter and Instagram.